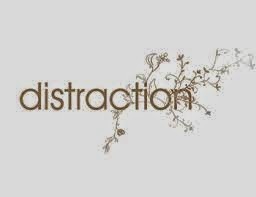 The distractions are of no existence,one may view them as distraction,while others may view them as totally helpful. Some may find that the varied feature allows one to understand the things in more pertinent way and the path is to be observed sensitively while/as it unfolds. The view point lies with one, the picture has hardly much meaning , until we give meaning to things. The path has to be made attractive/glorious with ones attractiveness of the inner being,the world for one that unfolds outside is just the expansion of inner self,the projection of one , the attraction of one to the events. One lives with its attraction,the rest turn into useful distraction ,and the entirety makes the ones life more colorful and natural. All so called attractions and distractions are ones own creation. In a play many character appears to be disappear sooner or later and the one left with his glorious attraction of self,the part of much greater design. The impressions left, the experiences are attractive, but one has to sail on the smoother surface of stillness and has to be more observer of the events to unfold its meaning. Its the meaning derived that has the sole meaning ,and denote how near one is toward equilibrium. What attracts us that distracts one ,if one is having a tendency to be attracted naturally to the ones state of existence ,the universe turns into a much better place . The forces that does not support to the wellness,the forces which will remain there till the expansion/volatility is not ended ,the universe has to find its boundaries and the all matters are to be linked into the harmony. The imagination of distraction is not acceptance of the reality ,the one need to be real and that could not cause any sort of anxiety,after all one is what one is and that is accepted by self,the views of others has meaning for them. The deviation is choosing the road ,when it is having many opening,all path tread ahead ,ones state of being is same at any given point of the time ,the age/wrinkles has no meaning and makes one no way different self at different times . Nothing is left there to take a impression of distraction,as all have enough finer elements and much of the events are non events.